I’ve been going along these last several months nose to the grindstone working on my book, when last week a package appeared for me from the arms of my FedEx guy. I couldn’t recall ordering anything and I didn’t recognize the shipper. The box was one of those delightful boxes, not colorful or funny-shaped in any way, actually quite the opposite — a perfectly medium sized, square, brown paper-wrapped box that could contain almost anything. I opened the box and there my eyes fell on a letter telling me I was a first place winner in the Inspired by Diabetes Creative Expression Competition sponsored by Eli Lilly and the International Diabetes Federation (IDF). I had entered last year and had pretty much forgotten about it. My winning submission is a photographic treatmentand a narrative about how living proudly with diabetes helps my management and brings greater joy to my life. My executive husband said, “Where’s the judge’s report?” “Huh?” I said. “We want to know why they picked your submission.” Seemed pretty clear to me, they liked it. However to satisfy his curiosity I called and asked if there was a judge’s report. “Huh?” the girl said who answered the phone at the Inspired by Diabetes office. After I explained she gave me the judging criteria: relevance to diabetes, creativity, narrative and emotionally impactful. Yup, just like I thought, they liked it but at least that satisfied the executive. The competition received 800 entries from around the world capturing the challenges and triumphs of living with diabetes in either photographic form, essays, poetry, drawings, paintings or music. There are four Grand Prize winners and 1st, 2nd and 3rd place winners. As a first place winner a donation of $500 is being made in my name to provide scholarships for children from low-income families to attend diabetes camps and in IDF’s Life for a Child Program which provides life-saving supplies to more than 1,000 children with diabetes in 17 developing nations. Winners of the U.S. competition are now being entered in the global competition, winners of which will be announced in the fall. This is an annual competition so if you are just hearing about it and want to enter next year, check out the Inspired by Diabetes web site. But back to the box. The box that my letter of congratulations came in contained a second box submerged under a hundred puffy pink Styrofoam chips. I didn’t open that box however for two days, not until my husband returned from business in Holland. I thought it nice we open it together so he could share the moment as he is my biggest fan and supporter. The evening he came home we opened the box and pulled out this trophy you see. We looked at the trophy and then looked at each other wondering what it was. I can’t remember what he guessed and I thought maybe it’s a double helix DNA pattern indicating stem cell research. But we really don’t know. All we know is we’re pleased as punch to be honored, contribute to such a worthy cause, and it woke me out of my deep and long slumber. Sometimes it’s easy to forget when you work at home alone most of the time that what you do does have an impact on others. That is until a mysterious box arrives and a letter saying local media may knock on your door to hear more about your life with diabetes. So, trust me, sometimes you can be awakened from a sleep by a kiss, as in fairy tales, and sometimes by a trophy. I’m just happy to be reminded now and then as I sit in my quiet living room typing away that I do make some kind of difference from time to time. 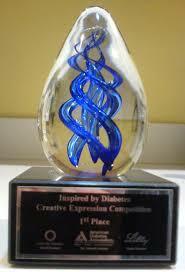 Now you would really make a difference to me if you could tell me what this trophy represents, any guesses?